When I was a kid, one of my first stories (scrawled in blue pen on a large, lined, and yellow legal pad) was about an asteroid that smacks into the Earth on New Year’s Day in the year 2997. In that same yellow legal pad, I also wrote a story about a society that is seemingly deep underground, only to reveal on the last page that it takes place inside an asteroid. The reveal occurs just as some of the people manage to escape in a stolen ship, because they knew the asteroid was about to hit a planet… on Earth calendar year 2997. And viola!, my first sequel/interquel/expanded universe was written. Experimenting with two perspectives of the same event. Flash-forward to the present. 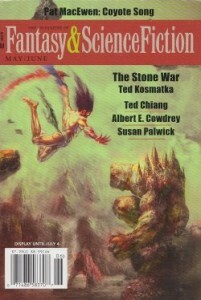 I have a novelette featured in the May/June issue of Fantasy & Science Fiction… almost certainly inspired by my childhood idea. I won’t say much about it, except that yes, it takes place on an asteroid. I have an interview in Fantasy & Science Fiction (which you can read here) which dives into more details on the research, writing, and themes of the story. The story is titled “Last of the Sharkspeakers”. And I’m happy with that title. World-building is one of the supreme joys of being a writer. It’s a beautiful, granular, detail-oriented neurosis. It’s putting yourself in the shoes of your characters and breathing their air, eating their food, shadowing them throughout their day. Done wrong, it can lead to tiresome info-dumps. Done right, the world blazes with a life of its own. Obvious world-building is found in full-on sagas, of course. In Dune, Arrakis could have been a generic sand planet; instead, Frank Herbert made it a world we could believe in. Geographical details, ecological considerations, and cultural traditions were served up against a galactic backdrop of court intrigue and some cinnamon-hued mélange. Robert E. Howard set his Conan tales in scattershot fashion across a primeval host of Stygians, Cimmerians, and Aquilonians. Lord Dunsany, H.P. Lovecraft, and J.R.R. Tolkien invented bizarre pantheons of alien deities for their respective universes; Tolkien famously invented entire languages for his indulgence in make-believe. And Stephen King, through a combination of prescient planning and skillful retconning, created several universes with the Dark Tower series. Short fiction deserves no less an attention to world-building, especially since a single story will not be bolstered or expanded upon by secondary installments. For example, in my story “The Scholar and the Books of Thoth” (published in Penumbra Magazine’s Egyptian mythology issue) I wanted to construct a world that went beyond the well-known props of ritual oils, hieroglyphs, and pyramids; I wanted to explore Egyptian thought itself, in which words were a form of magic and a person’s name was a cosmic component of the soul. Informing these exercises is my preference for originality. There are enough elves, zombies, and killer robots to go around. How about some sidhe, manitous, and sentient sludge? Instead of a future world that looks like Blade Runner, how about one with clear skies and crushing high gravity? Or inside a hollowed-out asteroid? In “Last of the Sharkspeakers”, the hollowed-out world of Ceres, and the people and beings that inhabit it, are all the results of this approach. And a lot of this doesn’t even make it into the final product. I often develop pages of backstory that never see the light of day, and yet… they do sort of snake their way in. A smell in the air. A shadowy figure in the corner of a tavern. The hint of history between characters and cultures. Just enough to whet the appetite, to show there’s a larger world beyond the borders of the story being told. And who knows? The details may yet give rise to other stories set within the same universe. After all, there were other spells in those books of Thoth, and there is much more to the universe that “Last of the Sharkspeakers” is set. I saw The Jungle Book and Captain America: Civil War recently. The Jungle Books by Rudyard Kipling rank in my personal Top Ten of favorite books. It’s not merely the details of setting or memorable characters that make it so impressive, but the episodic narrative. It’s not just about Mowgli. The tales range from the jungle to the Bering Sea, from the Law of the Jungle to the Rules of the Beach. They involve the elaborate cultural ecosystem of the animals of India, to the simple but cunning battle between a mongoose and a pair of sinister cobras. So naturally, I was always disappointed that earlier film versions (animated and otherwise) kept the narrative limited to Mowgli. Having said that, the newest cinematic interpretation is Jon Favreau’s best film, and was enjoyable. My only real complaint applied to the Disney cartoon as well. Kaa the serpent is not an antagonist. Rather, the powerful python is an ally of Mowgli’s — albeit not an ally the other jungle beasts are comfortable around. I would have preferred they follow the book over the cartoon in this respect; Kaa is given insultingly short shrift. Nonetheless, Scarlet Johannsen was pitch-perfect as the serpent’s voice; her husky, breathy, mesmerizing style already revealed to be a seductive instrument back in the film Her. Civil War is also a truly impressive feat of juggling lots of story and character elements without ever losing the audience. Kudos to the writers and directors: what they achieved was not easy to pull off. The superhero film bubble will eventually burst, but not with quality entries like this still coming out of Marvel Studios. It’s also nice to see the lessons of restraint being applied. The action is spectacular but not overdone; the movie paces itself to build a real narrative. And the big fight was masterfully handled not only in terms of choreography but also in emotional tone: these are friends forced on different sides of an ideological divide, after all, and so it refrains from becoming mean-spirited. You empathize with both sides of the debate. 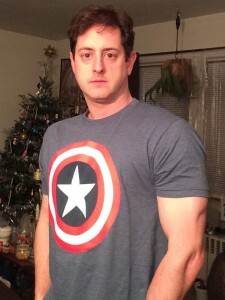 In closing, I recently gave an interview on Justin Trottier’s exceptional podcast The Star Spot (Episode 98) on how science fiction depicts extraterrestrial life. This entry was posted in Blog and tagged Aliens, civil war, fantasy&science fiction, jungle book, marvel, sharkspeakers, trottier, world-building, writing. Bookmark the permalink.